Image credit: © Alex Proimos Flickr. Some rights reserved. Sexual Maturity: Females 2 yrs. ; Males 3 yrs. Age at Weaning: 7 months but will resume nursing again when next offspring is born, up until about 13 months. Feature Fact: The camelid family evolved in North America for some 40 million years before migrating to Asia and South America; guanacos and vicuñas are their wild descendants. Society Press: The San Diego Zoo received the first pair in 1968. © 2009-2015 San Diego Zoo Global. Update 2015. How to cite: Guanaco (Lama guanicoe) Fact Sheet. c2009-2015. San Diego (CA): San Diego Zoo Global; [accessed YYYY Mmm dd]. 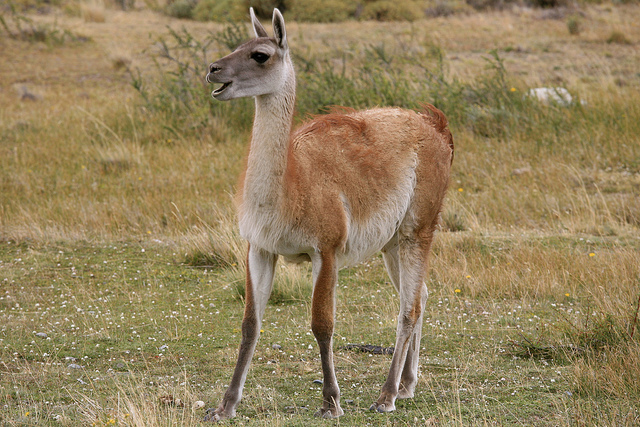 http://ielc.libguides.com/sdzg/factsheets/ guanaco.